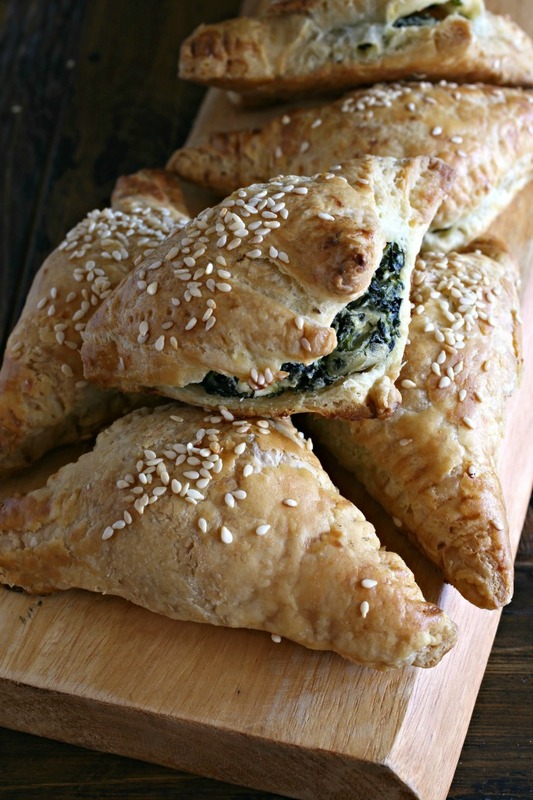 Puff pastry and frozen spinach are a couple of items that can usually be found in the back of my freezer somewhere. They're both useful to have around for all kinds of recipe options but, sadly, my freezer is underutilized. I keep nuts and vodka in there but tend to forget to look to it for food ideas. That needs to change. 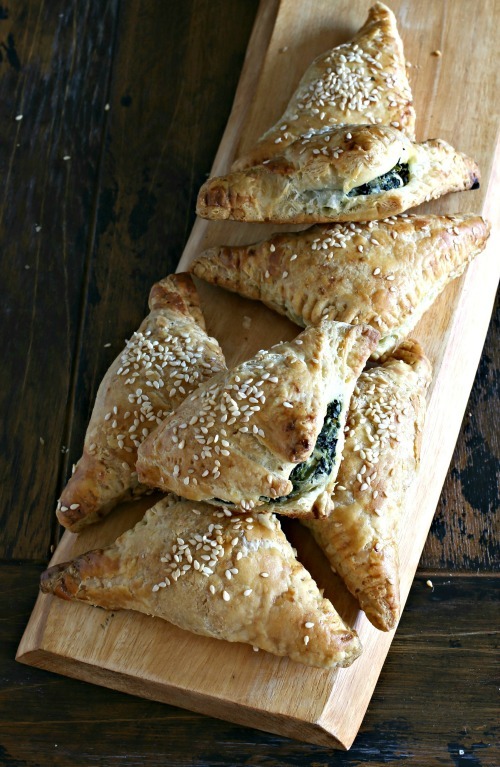 Last week, when I was reaching in to grab the peanuts I used in those crunchy treat balls I posted the other day, I resolved to make use of the spinach and pastry over the weekend. I even moved both out of the freezer and into the fridge to defrost...and to keep me from forgetting. 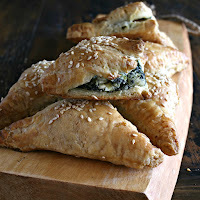 And so, on Sunday I rolled out the puff pastry and made a quick spanakopita-like filling with the spinach. That filling was pretty yummy on its own and I was tempted to just stir it into pasta. No reason not to do that if you leave out the egg, by the way. 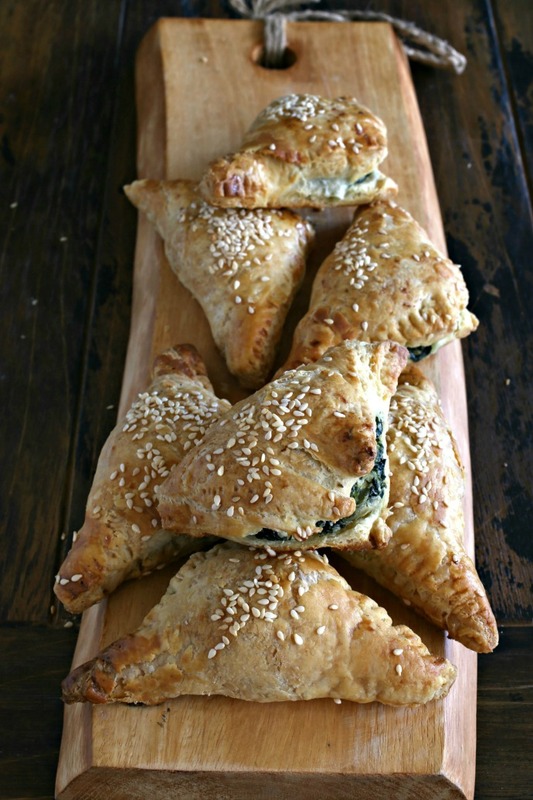 But I went ahead and made these easy little bourekas and ate a couple with a big salad. You can make them larger or smaller as appetizers depending on what you need. I got a crispy, flaky pastry with a creamy and flavorful center and a renewed resolve to not ignore my freezer so much in the future. Enjoy! Add the diced shallot and olive oil to a large skillet and saute for a few minutes until the shallot becomes translucent. Wring all the moisture out of the defrosted spinach and add to the pan. Continue cooking on medium low heat for a few minutes and then stir in the ricotta, feta, pepper, salt and nutmeg. Taste the mixture for seasoning, remove from the heat and allow to cool slightly. When cooled, stir in the beaten egg yolk. While the mixture is cooling, pre-heat the oven to 400 degrees. Roll out the puff pastry sheet to 12" x 12" and cut out 9 squares of 4" each. Place about an ounce of the spinach mixture into the center of each square, fold over on a diagonal and crimp the edges with a fork. Place the turnovers on a baking sheet lined with parchment paper, brush with the egg wash or cream and sprinkle on the sesame seeds. Bake for 15 to 20 minutes or until the pastry is a light golden brown.